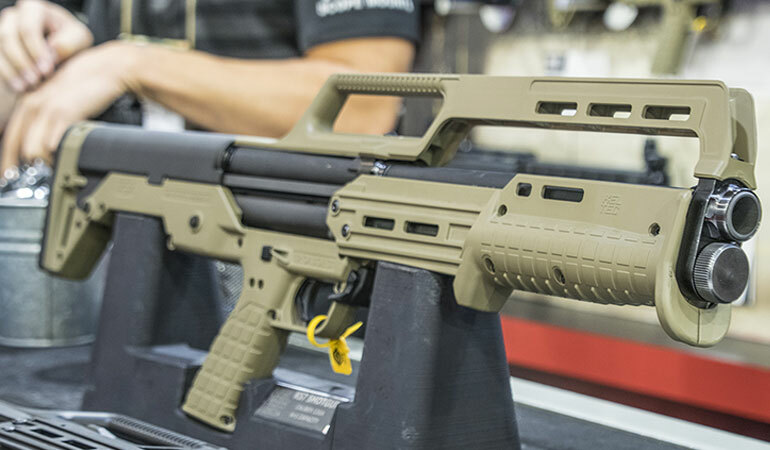 No, this isn’t a prop from a new Aliens movie, it’s the budget-friendly bullpup shotgun from Kel-Tec. Clint Smith of Thunder Ranch once said, “The only purpose for a pistol is to fight your way back to the rifle you should’ve never laid down.” And many, including myself, wholeheartedly agree with that statement. And with the rise of the modern sporting rifle, never have shooters had more high quality choices available to them. In fact, there are so many great long guns out there, it’s difficult to keep track of them, as well as the newest ones to come out. So that’s why I took the time to get the scoop on all the great new shotguns and rifles appearing at SHOT Show 2019. So buckle up, and let’s go on a journey to Vegas, and check out the most exciting long guns of SHOT Show 2019. When Kel-Tec first unveiled their KSG shotgun back in 2011, it was revolutionary for bringing the concept of a higher-capacity bullpup shotgun to market. Sure, exotic bullpup shotguns like the South African Neostead had existed for awhile, but because of a combination of political, financial and mechanical issues Americans basically couldn’t get their hands on one. Still, the original KSG is a little North of what many Americans in need of a home defense gun can afford, with an MSRP of $900. In response, Kel-Tec unveiled the KS7. A budget-friendly bullpup shotgun. Utilizing the same pump-action method of operation of the original KSG, the KS7 differs from it by utilizing only a single magazine tube. Hunters in areas of the country that have historically been restricted to straight-walled cartridges, haven’t had the luxury of hunting with America’s favorite black rifle. Consequently, they’ve been restricted to mostly lever-action and bolt-action rifles. While still effective, these types of firearms haven’t benefited from the dozens of ergonomic enhancements of the AR-15. But the engineers at Winchester and CMMG have decided to change all that with their new Resolute rifle chambered in .350 Legend. The Resolute itself is exactly what you’d expect from CMMG: a direct impingement rifle with an aluminum receiver, free-floated rail and the excellent ergonomics of an AR-15. But it’s the new chambering that really sets it apart. I had a chance to get a sneak peek at the new cartridge a few months ago in the beautiful Ozark mountains courtesy of Winchester Ammunition. While I didn’t get a chance to shoot it, the details being released were very exciting; allowing shooters stuck in restrictive hunting areas to keep all the power of their favorite .30-30 Win rifle in a semi-automatic, lightweight, modular weapon. Not to mention the fact that Winchester is already brewing up a half dozen different loadings for the round including heavy subsonic loadings and blisteringly fast supersonic ones. This is where the new gun and ammo combination has the potential to really shake up the hunting world. So shooters in areas like Ohio will soon be hopping on the AR-hunting train like countless others have before. 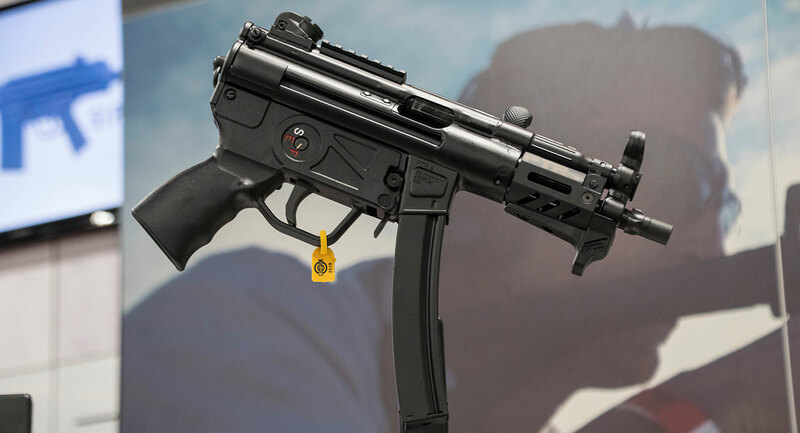 Unfortunately, PSA didn’t have a gun available for photography, while their biggest competitor, PTR Inc, successfully launched their own MP5 clone last year and just added two new models: a 94-style carbine and the “k” pistol shown here. Before I begin, yes I’m aware that this gun was supposed to already be released by this time. But, given that the engineers are Palmetto State Armory aren’t just trying to build a better MP5, but also a much cheaper one, it’s understandable that it’s not quite ready yet. For those of you not in the know, PSA is a company that made a reputation for itself building and selling components for the AR-15 series of rifles. It distinguished itself from the competition by offering these rifles and components at unheard of prices. Prices normally reserved for lower quality, not-quite-in-spec guns and parts. Instead, the folks at PSA managed to lower their prices by utilizing an economy of scale – building so many parts and guns that they could afford to sell them at a much lower price than their competition. And the South Carolinian company is attempting to do the very same thing with the historically pricey MP5. And while no small undertaking for a company experienced with the platform, it’s an almost immeasurably hurdle for PSA given that the overwhelming majority of their expertise lies with the AR-15. Thankfully, they’re not in it alone. The lower and handguards are being made by the king of polymer gun parts: Magpul. That name alone is enough to help them sell hundreds of MP5s, but it’ll be the quality of the builds coupled with the final price point that will ultimately decide if PSA’s latest venture is a successful one. Love them or hate them, there’s no denying that Century Arms is one of the biggest importers of firearms in the United States. And with that sort of reputation, it’s no surprise that they’re always on the prowl for new guns and accessories to bring in from overseas. One in particular that American shooters haven’t seen in a very long time, is the Romanian PSL. Chambered in 7.62x54r, the semi-automatic, magazine-fed PSL has often been erroneously called, “a poor man’s Dragunov.” While similar in appearance, the PSL isn’t a sniper rifle and is totally different mechanically. 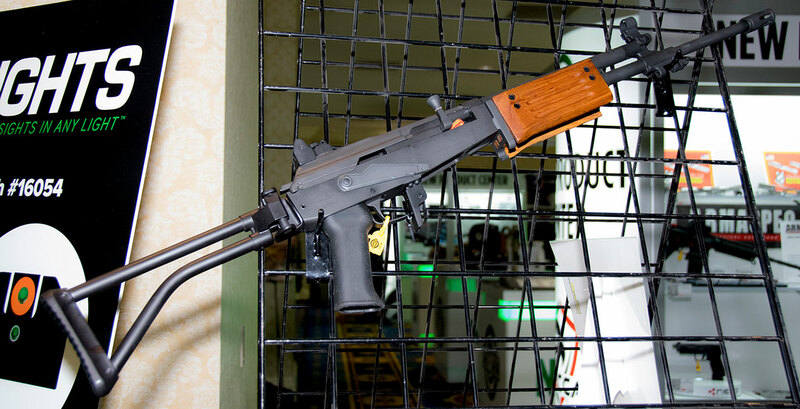 In fact, the PSL much less Dragunov, and much more a beefed up AK chambered in a bigger caliber. Despite this, the PSL is capable of respectable accuracy – often grouping between 3 and 4 MOA. Not a tac-driver by Western standards, but accurate enough for mid-ranged DMR work. Fair enough, but why does that matter? For years now, no PSL rifles have been imported into the US. Consequently, the prices on used models have gone up exponentially. With some resellers asking for $2,000 for the rifle! Seeing a spot in the market to act on, Century Arms decided to import new-production PSL rifles for sale in the US. These new guns will ship with the whole kit, including the PSO-pattern sniper scope designed for the 54r cartridge. These new guns won’t be nearly as inexpensive as those imported more than a decade ago, but that’s to be expected. These new PSL rifles should be available by Summer 2019. Many writers, myself included, were very surprised by ATI’s announcement of a Galil carbine. And even more are very excited about it. Israeli weapon fans rejoice! Finally, new Galil clones will again be available in the United States! Better yet, they’re at an affordable price point: $1,200! This news came as a total surprise to me and many others. Not just because new galil builds haven’t been around for years, but because of the company building them: ATI. ATI or American Tactical Imports, is a small company that only a few short years ago, relocated to Sumter, SC. Previously, ATI limited their products to .22LR firearms imported from Europe, and various handguns and inexpensive shotguns from around the world. But none of the products sold by ATI were Israeli or Kalashnikov-related. Making this new parts kit build very unexpected – but more than welcome! 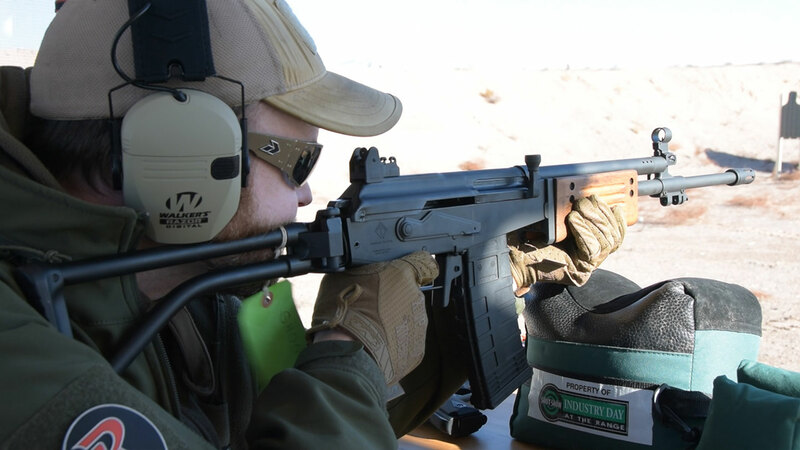 The Author was fortunate enough to get some trigger time behind the new ATI Galil at Industry Day at the Range. It ran flawlessly, and was very soft-shooting. 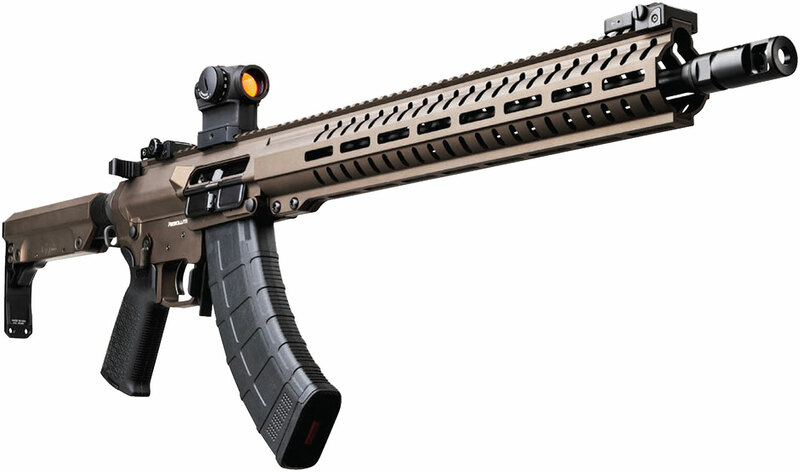 At SHOT Show 2019, the representative for ATI confirmed that ATI would be importing not only polymer-furniture models, but also the classic wooden handguard versions. All models being imported appear to be based on the LMG model featuring the cutout and hardware necessary for the bipod. The representative also mentioned that while the base models would not ship with this bipod, limited special editions would be available later that would include it. So shooters in search of that iconic Israeli workhorse can finally get their fix. My name is Jim Grant, and I’m an Armalite AR-18 addict. I have a problem, and no amount of AR-18 or AR-180 clones can quench my thirst for more. Thus, I was absolutely enthralled by the latest announcement by Brownells: the BRN-180. The BRN-180 is an AR-180 (the extra, “0” designates it as semi-automatic only) dressed to the nines, decked out in modern furniture. But it’s not a rifle, or a firearm of any sort. 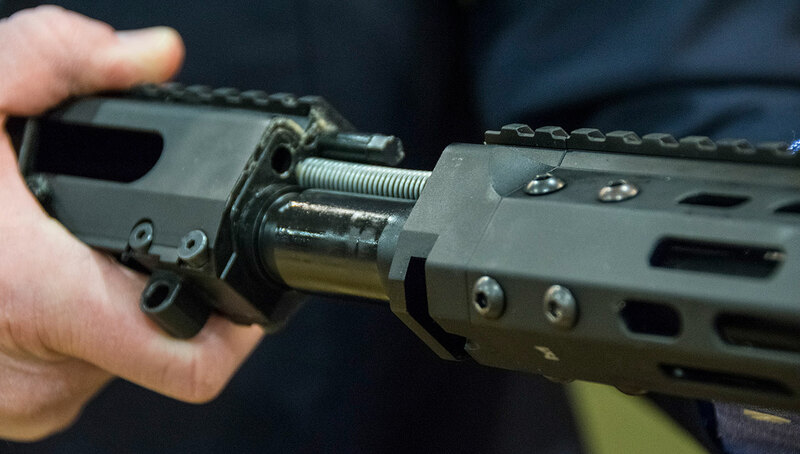 It’s ‘merely’ an upper receiver designed to work with a standard AR-15. You read that right. Finally, the modularity of the AR-15 meets the simple, reliable operation of the gun that came after it – the AR-180. This is huge news for fans of both piston-driven carbines, and those of the Armalite rifle in general. While the rifle was absent at Industry Day, Brownells did have it available for photography and handling at their booth the day after. What started off as a quick announcement that drew only a small crowd, quickly swelled with curious bystanders and black gun enthusiasts. Brownells BRN-180 includes a monolithic upper whose KeyMod handguard features a QD, tooless quick-change barrel option. Indeed, the new upper is extraordinary. It uses a modified carrier, extended original-style charging handle and a railed handguard to bring the 180 of old into the 21st century. While originally only available in 5.56mm /.223, plans are underway for a .300 blackout version should the gun prove popular enough. As someone who has always loved the looks, feel and reliability of the 180, but was annoyed by its lack of aftermarket support, this is fantastic. Truly, it seems that Brownells has outdone themselves with the new upper. Availability on the BRN is slated for March/April, and the upper will retail for $799 on Brownells.com . What a ride! While going in to this year’s SHOT Show, I was terribly excited for any product in particular, the plethora of excellent long-guns has my bank account weeping with despair! I just can’t wait to grab so many guns I saw at SHOT. And given the size of the event, there’s bound to be dozens more that I simply never saw. So be sure to check with all our publications – print and electronic – to get the all the scoops from this, and future SHOT Shows.